Like Mozart and Beethoven before him, German-born Johannes Brahms (1833–1897) was a classical music child prodigy. Luckily for him and for us, his father (a bass player) recognized and nurtured his talent during the formative years. Johannes Brahms, one of the greatest of all composers of classical music. But unlike his musical predecessors, who acquired musical posts in such exalted surroundings as cathedrals and castles, Brahms, got jobs playing piano in Hamburg’s taverns and brothels. 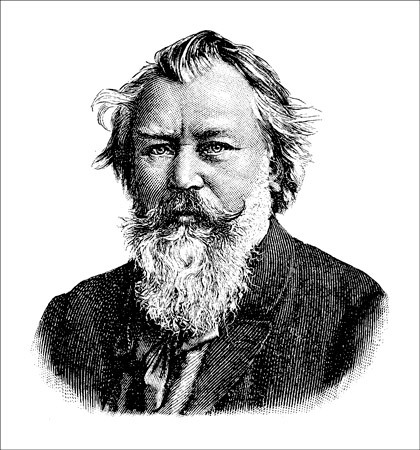 Still, a job was a job, and Brahms became familiar with a huge amount of music — especially dance music, which he performed every night during his teenage years. Brahms was 20 when he got to meet the famous Robert Schumann. Upon experiencing Brahms’ music, Schumann knew he was in the presence of a genius. But Robert wasn’t the only Schumann who took an interest in young Brahms; so did Robert’s pretty wife, Clara. History doesn’t record exactly how close she and Brahms became — except to note that after Robert Schumann’s death, Brahms and Clara spent more and more time together. Eventually, Brahms became one of the leading composers of the day; his fame spread throughout his native Germany and beyond. The celebrity German pianist/conductor Hans von Bülow coined the phrase “the three B’s: Bach, Beethoven, and Brahms.” This honor must have been incredibly flattering to Brahms, but it also saddled him with a great feeling of responsibility to carry on the great German-Austrian tradition in music. He even settled in Vienna, where all the greatest masters had lived. Brahms carried out his responsibility well, adding a warm, rich, Romantic expressiveness to the forms and structures of Baroque and Classical music. But he was one of the most self-critical composers in history. He threw out dozens or even hundreds of compositions before anyone had a chance to hear them. In fact, he didn’t publish his first symphony until he was 43. By way of contrast, by the time Mozart was that age, he’d published 41 symphonies, died, and been buried for eight years. The reason for these complaints is that melody was not Brahms’ strongest suit. Like Beethoven, he often worked with little musical ideas called motives — just two- or three-note licks, for example — and worked them out in ingenious ways, exploring all the possibilities and permutations. The result was stunning, but not always what you’d call hummable. Because there’s perfection aplenty in most of Brahms’ works, you can start almost anywhere and get an awesome sampling. But here are some of our favorites. All four of his symphonies — but listen to no. 2 first!